We use the Internet every day and carry it in our back pocket. Google connects us with any information you could need and uses algorithms to give you the info you want most. When your potential customers are looking for a product or service online, search engines show the sites that have the most authority and relevant content. Google also takes location into consideration. 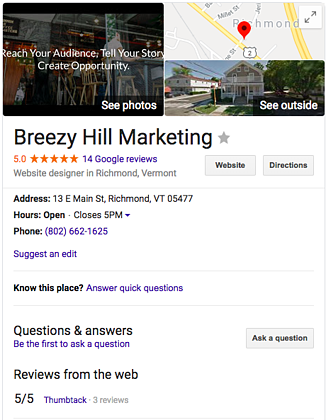 Local searches make up 20% of Google searches, and with almost 3 billion local searches monthly, local SEO can help get your content in front of the right audience. Search engines use information on location, local content, social media pages, and other information that indicates the location of your business. My Business by Google is the most popular and well-known display of local SEO. My Business has lots of helpful features and is customizable for your business’ needs. Including contact info, addresses, hours, images, and recent posts, there are lots of different ways to build up your profile and optimize your site. One of the best features- the reviews page. How do Reviews Effect SEO? Reviews can make or break a sale. Almost 77% of online consumers use reviews before making a purchase! But besides how reviews affect sales, what can they do to your local SEO? Whether you use My Business or display on your site, reviews can build up your local ranking. We know that authority factors into Google’s ranking algorithm. When you get a customer review, there is some evidence that this business is legitimate and is engaging with customers. Search engines use keywords to find relevant content, which is why you make sure to include these keywords throughout your site. Reviews work the same way even if you or your customers don’t realize it! When writing a review, customers will usually describe the product or service using keywords, which gives more opportunity for a search engine to find your site. 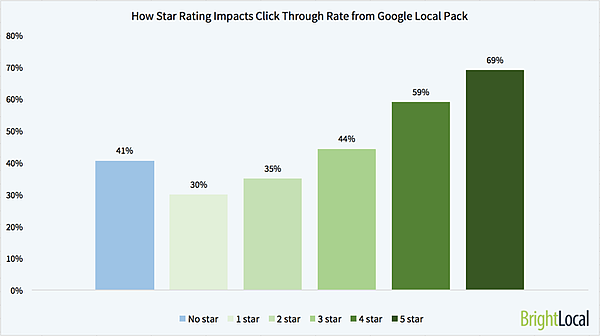 For many consumers, overall star-rating is the most important factor when evaluating a business online. The thought process is simple- the more satisfied the customers, the better the reviews, the more reliable the business. Star ratings allow the consumer to make a quick judgment of your business, which can be correlated to click-through-rates. So now that you see how impactful reviews and local SEO can be, you’re probably looking to get more reviews. Here are a few tips to help bring in more customer feedback. Include call-to-actions at key points in the buyer’s journey to encourage feedback. For example, some businesses may send an email asking for a review shortly after a purchase is made. It’s convenient to follow a link from an email and write a review, and the customer can give an honest review of the product after a few weeks. My Business includes Google reviews, but there are many other platforms for customers to give their feedback. Yelp, Amazon, even Facebook are popular options. You can also look for industry-specific review sites. Check out a list here. Special offers are always a great motivator. When asking your customer to give you a review, try offering something in return. Discounts, coupon codes, contest entries… get creative to really incentivize. Offering a discount after giving a review or referral will not only encourage reviews, but also create a return customer who may write another future review. You can respond to reviews on most sites. You should respond to every review, even the bad ones- especially the bad ones. Acknowledging a mistake or short-coming and providing empathetic customer service will build customer trust and satisfaction, and in the long run, improve your ratings. Reviews are content. As mentioned earlier, reviews can contain keywords that can help ranking, and they’re one of the most important drivers for online shoppers. Sharing these positive reviews with your followers will help build your relationship and encourage conversions. 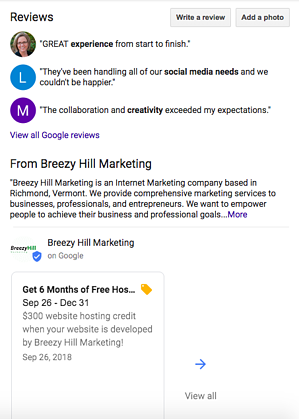 Sites like Google also let you upvote reviews you find helpful, making them more visible to future viewers. Your customers talk to you through reviews, make sure you’re listening! Not only can positive reviews increase click-through-rates and build customer trust, but they’ll boost your search engine rankings so your business is seen by your target audience. Should You Be Measuring Your Website Performance?